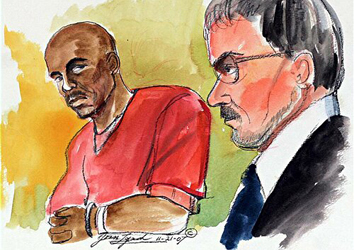 — Audio recordings of two interrogations Oakland police Detective Sgt. Derwin Longmire conducted with Your Black Muslim Bakery leader Yusuf Bey IV, 22, on Aug. 3 at the Eastmont Town Center police substation. The first was conducted at 11:55 a.m.; the second at 8:12 p.m.
— The audio recording of Devaughndre Broussard’s confession, given to Longmire at 9:13 p.m. Aug. 3 at the Eastmont Town Center police substation. Broussard, 20, has since recanted the confession. — The video recording of Bey IV; his half-brother, Joshua Bey, 19, and Tamon Halfin, 21, in an interview room at the San Leandro Police Department from 9:48 a.m. to 11:48 a.m. Aug. 6. — Longmire’s typed log of developments in the investigation from Bailey’s shooting Aug. 2 through Broussard’s confession the next day. — Longmire’s handwritten notes and summaries of his interrogations with Bey IV, of Broussard’s confession, and of an interview with Halfin conducted at 6:48 p.m. Aug. 3. — Longmire’s handwritten notes of an interview with Joshua Bey, conducted at 3:42 p.m. Aug. 3. — Longmire’s typed declaration summarizing why enough evidence existed to charge Broussard with killing Bailey. — Statements given to police by people who witnessed Bailey’s shooting or who saw the gunman and white van prior to the shooting. — The handwritten notes and summary of Longmire’s questioning of van owner Rigoberto Magana, conducted at 1:15 p.m. Aug. 6.